Last week, I read a Maya Angelou novel for the first time ever–I Know Why the Caged Bird Sings. Ironically, it was during the same week in which she died, RIP. This means that the news is full of retrospectives on her life and the impact of her work, most of them singing (deserved) praises. I feel it is necessary, then, to state upfront that the strange confluence of me having read and now writing about this book while all this reflection is going on is utterly coincidental. I’m not going to talk about Angelou’s legacy, because I haven’t read enough of her work or about her life to have anything to say. Instead, I’m just going to talk about I Know Why the Caged Bird Sings the same way I would review any other book. Everyone else is talking about the forest, but I’m only worried about this one little tree. 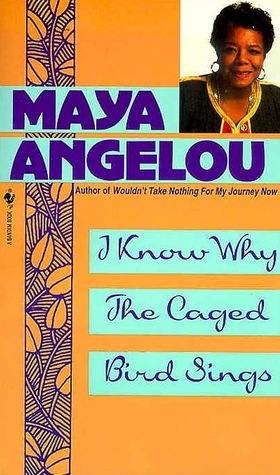 For those who don’t know (or perhaps don’t remember), I Know Why the Caged Bird Sings is an auto-biographical novel about Angelou’s formative years, starting when she was a 4-year-old child of divorce, shipped off to Stamps, Arkansas to live with her grandmother, her uncle, and her beloved brother Bailey. This segregated, highly religious small-town aesthetic informed a lot of her worldview, but her childhood is remarkable for the wide variety of different cultures she’s thrown into. She variously lives in Chicago, Oakland/San Francisco, and San Diego (where she spends some time homeless, living in a junk yard). The novel touches on her experiences with racism, both blatant and more subtle; sexual assault, sexual awakening and teen pregnancy; religion; economic upheaval; and about a million other topics, as you might expect from someone living such a varied and complicated life. This is undoubtedly an important novel. The many intimate snapshots of black culture under segregation in various cities alone makes it a cultural milestone, but Angelou’s personal perspective on these questions is nuanced and complicated, and therefore both interesting and challenging. It’s a touchstone for understanding racism and sexism in this country, and Angelou manages to explore these questions in the context of her own life in a way that feels conversational rather than dictatorial. It also manages to be quite funny in places, while also maintaining its intensity. That said, this is clearly an auto-biography, and not a novel. It doesn’t have the pacing and carefully plotted beats you would expect from a fictional narrative, and the transitions between sections can thus be jarring. Really, it feels more like reading a series of short essays rather than a novel, which is perhaps indicative of how very disruptive Angelou’s childhood was. The book often drops you from lofty intellectual and emotional proclamations straight into weirdly sterile exposition, which is super jarring and sometimes even makes you turn back a page, thinking you missed something. Understandable for an auto-biography, though; this novel is intimately concerned with telling the truth as Angelou remembers it, and real life rarely conforms to the conventions of fictional arc-plots. Still, the transitions could use some work. Overall, I enjoyed reading this novel, and got a lot of perspective out of it, but from a craft standpoint it felt a bit unfinished, as though it didn’t go through the final round of edits. There were story lines that were never followed up on, characters who would disappear for so long you’d forget who they were, personal revelations that came out of nowhere instead of building on themselves, and an oddly un-conclusion-like conclusion that left me wanting a sequel for the rest of the story. But I suppose all that means is that I need to acquire another Angelou novel. TL; DR: this book deserves its accolades, though it’s pretty rough around the edges. 7/10, would read again (but not right away).